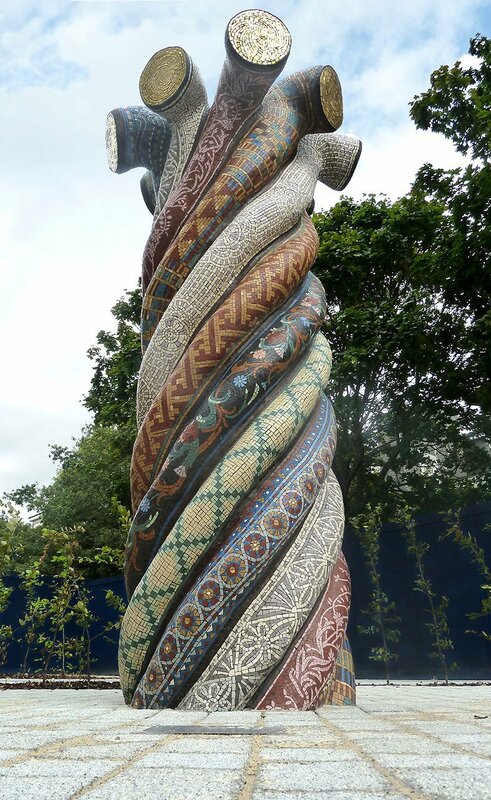 Entwined Histories Mosaic Sculpture, a 3 metre (10 ft) high sculpture celebrating Poplars community roots. The aim of this sculpture was to celebrate the many migrant communities that settled in this part of east London. The sculpture is on the site of a former major rope makers, producing ropes for the London docks, and it is the presence of the docks that lead many migrant communities to settle here throughout history. Each strand of the rope sculpture represents a different community through their own textile patterns. Find out about the designing of the Entwined Histories sculpture here.